Here's how the antihero came to life on the big screen. After producing post-apocalyptic horror comedy Zombieland and crime drama Gangster Squad, filmmaker Ruben Fleischer entered into the realm of superheroes with Venom. The Marvel film tells the story of Venom, a volatile parasitic alien symbiote that inhabits other beings, as it finds a host in investigative journalist Eddie Brock (Tom Hardy). This relationship comes to the boil as Brock uncovers the nefarious plans of a survivalist corporation known as the Life Foundation run by Carlton Drake (Riz Ahmed). "They’re two sides of a coin," states Fleischer. "Venom is an adulterated Id of Eddie Brock and is an alien that you have to learn how to train and have behave appropriately in our civilisation. It’s a buddy movie in a weird way." 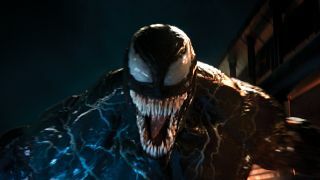 Spider-Man fans will already be familiar with Venom through previous films and comics, but bringing the villain to life this time round posed unique challenges for the film's visual effects supervisor, Paul Franklin. "We realised quite early on that things like camera motion capture, which have been used on other 3D movies to create digital characters, wasn’t going to work for us because one of the key things about Venom is while he’s humanoid in shape, he’s able to move at incredible speeds and can do extraordinary moves." "He never moves like a human being. The most important thing was to have some sort of positional reference so you could frame up for the shot. We got a tall stunt performer who is 6’10”, and because Venom is actually 7’6” we built him up even higher with a Wiffle ball on a stick sticking out of the top of his helmet." "Then through the suit we had motion-capture reference markers all over it so we could at least track his body movements and get a proper idea of where he was. After that it was down to the character animators to come in there and take the thing over." Whereas comic books have the advantage of being able to draw whatever they want on a frame-by-frame basis, Franklin didn't have the same amount of creative freedom. "Venom distorts quite heavily in the comics depending on what he’s doing," notes Franklin. "We don’t have that luxury in visual effects because we need to make it consistent across all of the shots, so that the audience feels like they’re watching the same character and not completely different versions from shot to shot." "Underneath all of that is what you would usually expect to do for a creature animation, like muscles and skin simulations, plus the stuff that combines it to the skeleton to preserve the volume and give him physical mass and presence." "Venom has this incredibly strong, densely built muscular physique. Working in tandem with that is this extra layer of effects animation that gives him gelatinous gooey qualities, which is what the character is supposed to be from the comic books." Venom is one of the most instantly recognisable Spider-Man villains thanks to his distinctive character design, but fans will know that he has two different forms. "The symbiote looks like an oily, gelatinous, slug-like amorphous creature that has no skeleton and is constantly changing shape and swashing around before bonding with the host," explains Franklin. Every shot of Venom involved effects animation to create all of the goo, in particular how it moves on his face. "We didn’t want Venom to feel like a guy in a suit. You wanted to always believe that this character could morph into slimy tendrils. We had this constant effect animation pass that created the movement of the edges of the eye and the way that the strains of goo stretch between the jaws as he opens his mouth, which is a characteristic of the comics." There were many challenges involved with lighting Venom in a night-time environment. “It’s black on black a lot of the time,” observes Franklin. What defines a black-painted metal object is not the direct illumination but the reflections of the environment around it. "What we needed to do was to dress the reflections into the surface in order to give us a read on the shape. Initially we were driving it from the HDRI maps that we captured on the locations on set, but Venom came out looking like a highly polished 1950s car driving down the strip in Vegas. He was a glittering galaxy of lights, which didn’t make him appear particularly threatening because he ended up looking like a Christmas tree sometimes!" Franklin continues: "We ended up lighting him in much the same way you would light a car for a commercial, where you’re using big reflection cards and bounce panels to carefully create reflections that sculpt to the shape of the body. Then we added a separate set of low-light reflections from the environment; this gives us the definition on the surface so we’ll be able to see his physique and all of the intricate organic patterning that moves over his surface." Giant white eyes are a signature of Venom and need to look alive rather than static. "We had to dress the reflections carefully into Venom’s eyes," states Franklin. "He looked best in a complex lighting environment such as the street where he first appears; that gave us a subtle low light and highlight in the eyes." "We also did things like subtle vignetting which we controlled on a shot-by-shot basis to give us some shape so they didn’t look completely flat. Even some subtle surface relief which is quite organic." The human eyeball isn’t completely smooth. "It has veining and all sorts of things going on in it that give it a subtle relief," remarks Franklin. "You don't necessarily notice it when you’re looking at a person's face but you notice it when it's not there. You sell the emotion through the shape of the eyes. "Venom has expressive eye shapes. We had to borrow from a cartoon approach to the character where you overdrive those eye shapes in order to get a read on them. Then to finally stop it from feeling static and dead, effects animation added this constantly moving, rippling edge to the eyes so that there's always something going on with them." Over the years, every kind of tooth shape has been incorporated into the Venom comics. "When he goes into his more extreme emotional poses the teeth can become massive," states Franklin. "You'll never be able to close his mouth. We needed to be able to subtly control the length and shape of his teeth on a shot-by-shot basis. "The teeth were given a slightly unclean texture, because if we made them bright, shiny white he looked like he had just been to the dentist and had veneers put on." No mean feat when you consider that the teeth are always glistening. "There was also a separate layer of goo, slime and saliva that played stronger in some shots than others. We found that if he was constantly drooling it became distracting. We used it as an emphasis." The same approach was taken with the tongue. "We have his tongue coming out but used it judicially," remarks Franklin. "Venom is relishing a moment where he's about to bite someone’s head off or is enjoying himself. Venom delivers quite a lot of dialogue in the film so we eventually had to pull that tongue back in. "We looked at Clint Eastwood and Jack Palance when they’re delivering lines through their teeth in films like Dirty Harry or Shane. If we tried to close his mouth completely over his teeth it looked odd because they’re huge." However all of these VFX obstacles pale in comparison to how readers have imagined the character over the years. "For me the challenge has been satisfying the fans' expectations and wanting to deliver a movie that people felt was the Venom they were hoping to see," says Fleischer. "Primarily that was in the look of the character, the way he acts in these action sequences and the way he’s true to the comics. My proudest thing will be if people feel that the Venom on the screen is the one they’ve been wanting to come to the theatres for a long time." This article was originally published in 3D World, the world's best-selling magazine for CG artists. Buy issue 241 here, or subscribe here.